MySearch123.com hijacks browser and Internet settings. Get reliable removal advice and insights into the adware behaviors. MySearch123 is where you stumble upon at various browsing points. The encounters are scheduled from within your PC. It is a piece of adware that forces browsers to open the above url. The adware program is often referred to as a browser hijacker. Indeed, it hijacks browser settings. 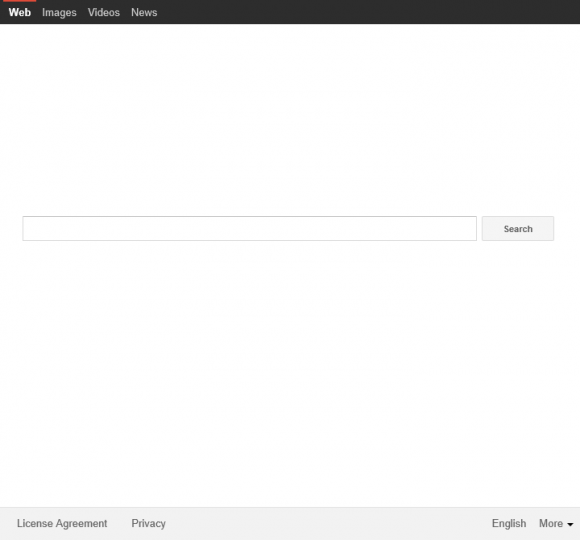 For instance, if you set Google as your default search engine, the hijacker breaks in changing it to MySearch123.com. Apart from search redirects, the hijacking may extend to new tab, start page settings. It may also include intercepting attempts to load third party websites. Instead of the address you are trying to reach, the adware loads its own destination. Such way of hacking is dominating the web. It does not include faking other programs as in case of bogus antivirus. No immediate damage to data on your PC applies. For instance, the advertising redirects do not encrypt files for ransom. Bad news is that the hacking remains tricky. It is not meant to be helpful for users. The business rests upon forcing you to watch various ads. As stated above, the ads replace default destinations. Moreover, the redirects may simply divert user’s request for user’s target addresses. Such hacking contributes to the hackers’ business. Each redirect to the destinations preset by the adware generates revenue to the hackers. One may object that MySearch123.com itself looks like a decent Internet site. It features search preferences and redirect to Google engine. It is but a gateway to Google. It is good to note the above web-address features quite common template. This template occurs at hundreds of web-addresses. The reason to register one and same page under various addresses is obvious. It is meant to get rid of ill-fame. Removal of MySearch123 is thus not a brand new request. It is basically about the same hack. The website itself seems to be dangerous. However, it conceals redirects to other pages. Those pages have their web-masters. They hold and maintain those pages. The web-masters pay to the hijacker distributors for each redirect arranged by the hijacker. The distributors to not verify the pages they promote. Basically, any website could be imposed on you through the hijacker. It is typically just annoying. Please beware, however, MySearch123.com websites may be also unsafe. You are thus encouraged to get rid of MySearch123.com for security reasons. The redirects to MySearch123 are arranged and maintained by relevant adware. Its installation typically completes without user quite understanding what is going on. That is because users load the redirect program as a secondary content. It is concealed on the background of target download. The target shall attract users. It is thus a popular piece of freeware or media. The hackers intentionally arrange the installation in such a way so as to keep user’s actually unaware of the adware arrival. Nevertheless, from legal standpoint users usually approve the adware installation. The legal approval only requires user to accept installation agreement. It is good to check contents loaded into your PC. Unaided eye of a human being tends to miss tricky adware inclusion into loaded packages. In order to remove MySearch123 ads and other redirects, make sure both adware and its presets are gone. The procedure below duly observes the above requirements. 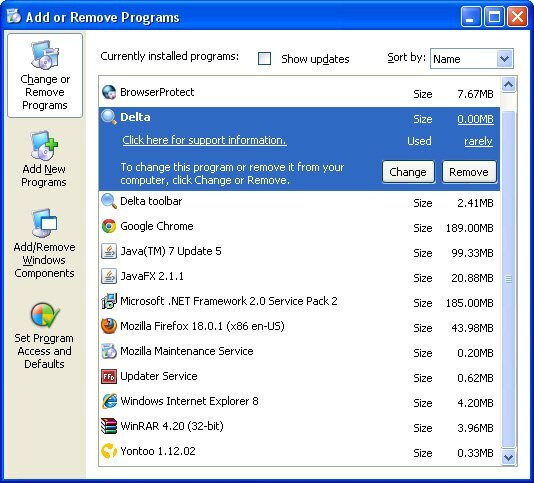 All the other adware uninstall methods being worth a try, the cleanup using automatic security software guarantees a proven fix involving little user effort and a trouble-free procedure. When the software returns a list of malicious and potentially unsafe items found on the PC, select Fix Threats in order to have the MySearch123.com infection uninstalled from your machine. An additional virtue of this process is the elimination of other threats that may be active in the background. Despite the fact that this is a fairly radical fix, resetting the affected web browser is effective. However, be advised you will lose your personalized settings such as temporary Internet files, history, cookies, saved passwords, web form data, toolbars and add-ons. So proceed with caution, and if you’re not sure – perform the cleanup using methods highlighted in the previous sections. 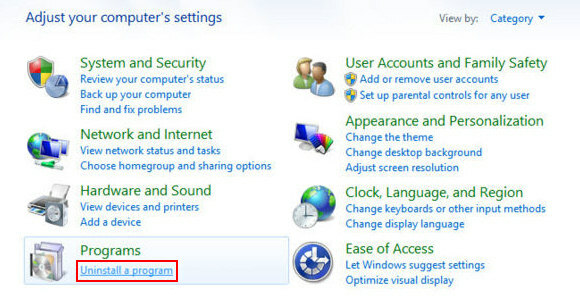 Open Firefox, expand the Help menu on the top of the window, and in the drop-down list pick Troubleshooting Information. Alternatively, simply type in ‘about:support‘ (without quotes) in the Firefox omnibox and hit Enter. Troubleshooting Information will open in a separate tab. Click the Reset Firefox button as shown. You’re now done. 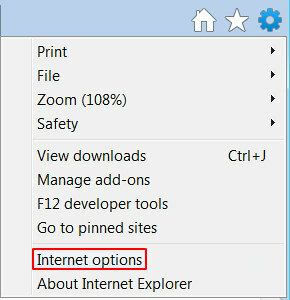 Launch Internet Explorer and proceed to Tools/Gear icon – Internet Options. Select the Advanced tab at the top and click Reset. 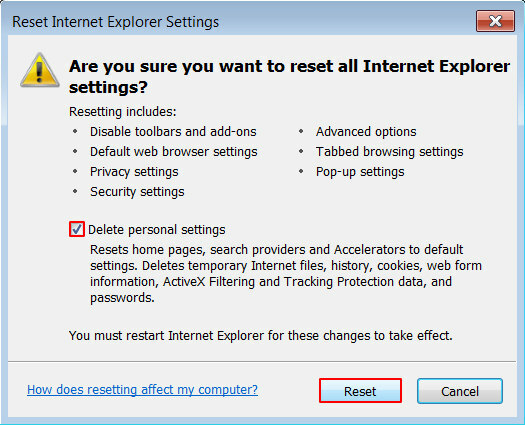 When IE comes up with the respective screen, read the warning carefully and, if sure, put a checkmark for Delete personal settings. Now click Reset. 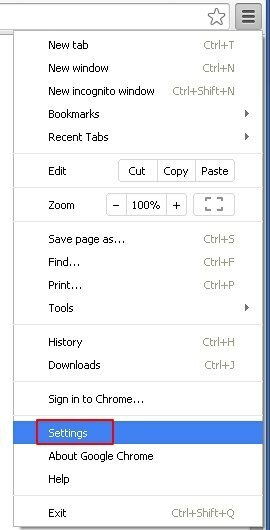 Open your Chrome browser, click the Chrome menu icon to the upper right and select Settings on the list. Alternatively, type in ‘chrome://settings‘ (without quotes) in the URL field. Find the Show advanced settings… link on the tab that opened up. 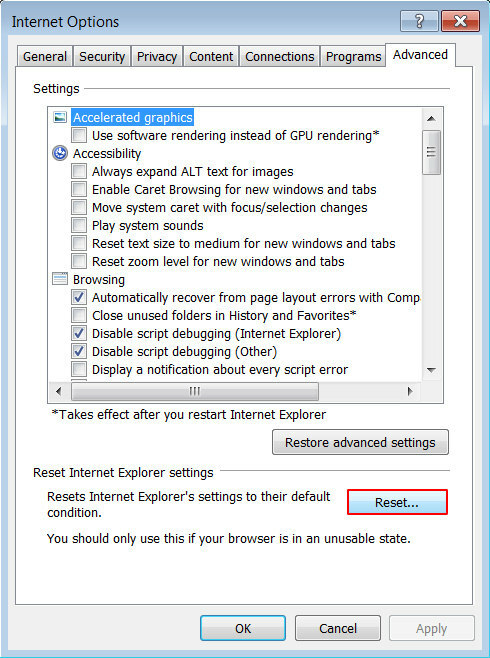 Under Chrome’s advanced settings, click the button that says Reset browser settings. Be sure to read the information about the personal settings that will be lost if the transaction gets completed. Click Reset if it’s fine with you. Given the likely persistence of this adware sample, it’s recommended to repeatedly check the machine for its components after the cleanup procedure has been performed. Rescan your system with trusted security suite to make sure MySearch123.com extermination has been successful.